Many homemade ice creams use eggs as an emulsifier to create a texture that is smooth, rich, and creamy, so it can be a challenge to find an ice cream recipe with no eggs. For those who are lactose intolerant or vegan, though, it's essential to find eggless recipes. Luckily, many recipes can still produce the smooth, creamy texture of a custard ice cream even without the eggs. With the aid of an ice cream maker to whip in air and break up the mixture, it's not hard to make egg-free ice cream at home, and vegan dairy substitutes such as coconut milk, almond milk, or tofu make vegan ice cream possible, too. This is a simple recipe that can be customized with fresh or frozen fruit, nuts, flavor extracts, and other ingredients. Serve it with chocolate syrup, fruit sauce, or another delicious eggless dessert! It makes two quarts of ice cream, enough to serve about eight people. You'll also need an ice cream maker for this recipe. If you don't have one, you can use a more rustic method of combining ice cubes with rock salt and using them to solidify a cream mixture. These ingredients will combine to make a basic vanilla ice cream, but the recipe is customizable to your preferences. You can choose to add chocolate chips, cinnamon, crumbled cookies, candy-bar pieces, or anything else you like! Combine all ingredients in a large bowl. Beat with a whisk until the sugar dissolves. 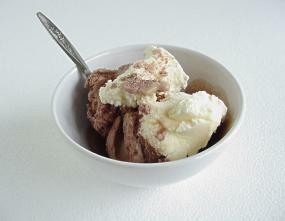 Pour the ingredient mixture into your ice cream maker, and freeze according to the manufacturer's instructions. When the mixture has thickened, pour it into a large container, and freeze until it's firm. With eggs serving as a common ingredient in most desserts, it can be tough for vegans to find dairy-free and egg-free treats. The search becomes even more complicated with ice cream, since its base ingredients are dairy products. 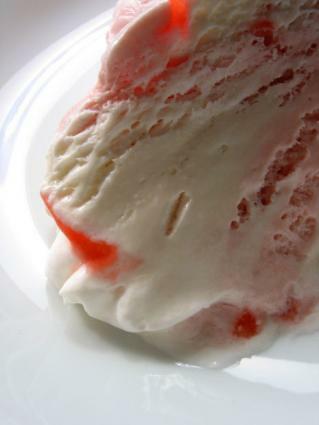 Sherbet is one egg-free dessert option that is often made with crushed ice, fruit, and other vegan ingredients, but it does sometimes contain dairy. Some vegan recipes use tofu as a base for ice cream, but it's just as easy to find a recipe that uses a dairy-milk substitute, such as soy milk. This ice cream recipe with no eggs is completely vegan and makes about eight servings of ice cream. Whisk 1/3 c of the soy milk with the 2 T arrowroot, and set the mixture aside. Combine the soy creamer, the remaining soy milk, and the sugar in a saucepan over medium heat. When it boils, remove it from the heat, and stir in the arrowroot mixture until the ingredients thicken. Add the vanilla extract or vanilla bean insides. Cool the mixture to room temperature, then pour into your ice cream maker. Freeze according to the manufacturer's instructions. When the mixture is thick, transfer it to a container and freeze it until it's firm. Other options for raw, vegan desserts with a creamy texture include variations on frozen bananas and coconut, which can make a frozen treat similar in texture to soft serve ice cream.